Let me be personal. 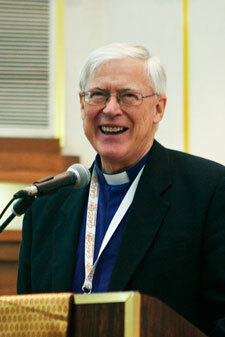 The Global Anglican Future Conference in Jerusalem was one of the highlights of my life. Primarily it was a spiritual conference and a spiritual experience. As one of the organisers, I was in a position to see how the Lord answered prayer again and again. To organise a conference of this nature in the time available was simply extraordinary and I must testify to you the Lord’s continual faithfulness. I know that many people all round the world were praying for us during the whole time, not to mention that the conference itself was much given to intercession. There was a sense of seeking the Lord’s will. I will illustrate. My natural personality prefers to have things organised well in advance. I was therefore giving a great deal of thought in the run-up to the conference about what the conference should say and do. The chairman Archbishop Peter Akinola of Nigeria asked us all to stop doing this. To him, it was very important that we sought the mind of the Lord in listening to God’s word and listening to each other. I found this decision a difficult one, as I was conscious of how little time there was to achieve our purposes, the sheer variety of people attending and the complexity of the issues facing us. It meant a new level of trust in the Lord. We followed the chairman’s wisdom. The result was the Jerusalem Declaration, a document which in my opinion is going to be regarded as one of the most significant statements in the unfolding history of the Anglican Communion. I have to say that as I heard the final version read out by Archbishop Orombi, I was in tears. In part this was because of the content, which meant so much to the people who had shared their painful stories with us. But it was also because I had seen the Lord do something in our midst which I could not have anticipated. This entry was posted on Friday, September 5th, 2008 at 11:32 am	and is filed under Uncategorized. You can follow any responses to this entry through the RSS 2.0 feed. You can leave a response, or trackback from your own site.